Companies face a deep and widening complexity gap; between their current offering and the emerging behaviors and needs of their customers. Failing to see the economy from the customer’s perspective and taking a back seat to behavioral change may drive the gap even wider. Slowly developing social change, from women’s liberation to higher standards of living etc. are all impacting what people demand from their products and services. People don’t want boxes, they want their products to deliver on more values than just being objects – they need to be meaningful, personal, controllable and develop with customers needs and habits over time. We are experiencing explosive technological change – affecting how people do things in order to reach their goals. This is instrumental to the complexity gap. Fortunately, with a bigger idea/understanding of what technology is it becomes simple to grasp. If you break technology, people, business and markets into its barest essentials you end up with four components. On the left – people (biology), and on the right; what they want – their outcome. In between people and their goals are two essential components to any business – the reason there is a business in the first place; technology and behavior. First: what technology does is that it accommodates a certain behavior. A Walkman allows for one way of listening to music, a vinyl record player a different way. Then there are MP3’s, Spotify, concerts, radio – all offer a different way or situation to enjoy music dependent on if the customer’s goal is an event, silence, relaxation, escape, entertainment, battle boredom etc. 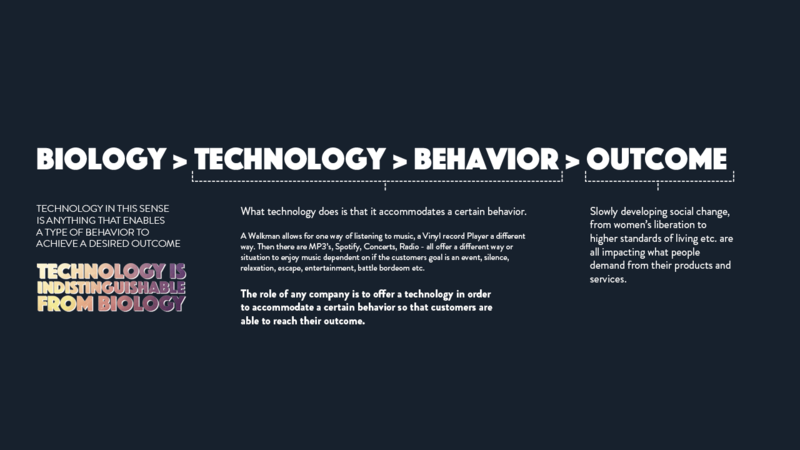 The role of any company is to offer a technology in order to accommodate a certain behavior so that customers are able to reach their outcome. In this sense technology is anything that accommodates a certain behavior to achieve a goal. People are paying companies for their technology/behavior so that they can reach their goals. – Slowly developing social change is affecting what people want, their outcomes. – At the same time new technologies and new behaviors are impacting how they can and want to reach those goals. In other words, there are two developing changes playing out at the same time that both affect why people want to hire technologies: new goals and changing behaviors. 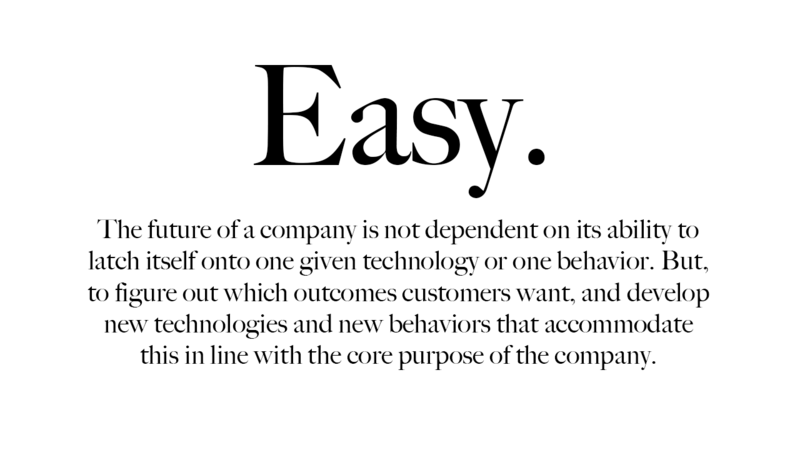 The future of a company is not dependent on its ability to latch itself onto one given technology or one behavior. But, to figure out which outcomes customers want, and develop new technologies and new behaviors that accommodate this in line with the core purpose of the company. Companies who fail to see their world through their customers eyes understand emerging markets as asymmetric, complex and irrational (because it doesn’t look like the well-behaved corporate centric industries that we have been taught to think in terms of for the last 100 years). But for companies who see the world from a human perspective – these changes aren’t complex – they are the natural development of all technologies and almost indistinguishable from human and societal evolution for the last 100 years. “We must try to put ourselves inside their skin, and look at us through their eyes just to understand the thoughts that lie behind their decisions and their ations” – Robert Strange McNamara – former defence minister under John F. Kennedy explaining how Tommy Thompson, former ambassador to Moscow helped the President avoid going to Nuclear War with the USSR during the Cuban Missile Crisis in 1968. From The Fog of War. The future is only complex if you fail to understand it from the point of view of what is driving the change. 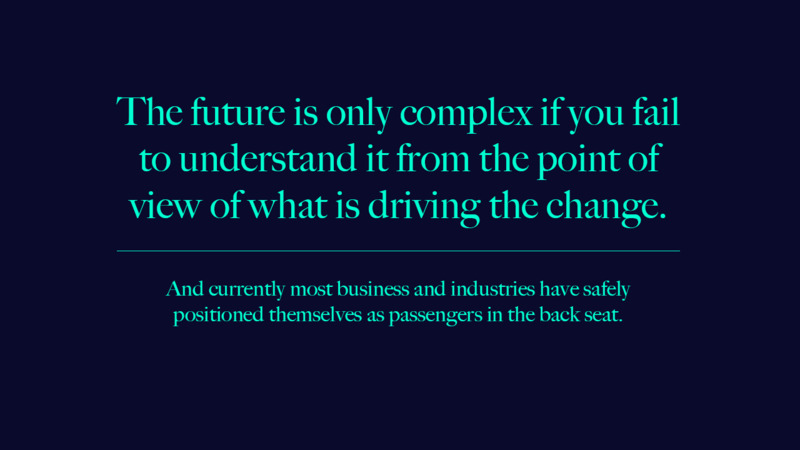 And currently most businesses and industries have safely positioned themselves as passengers in the back seat. Previous Post The red or blue pill?